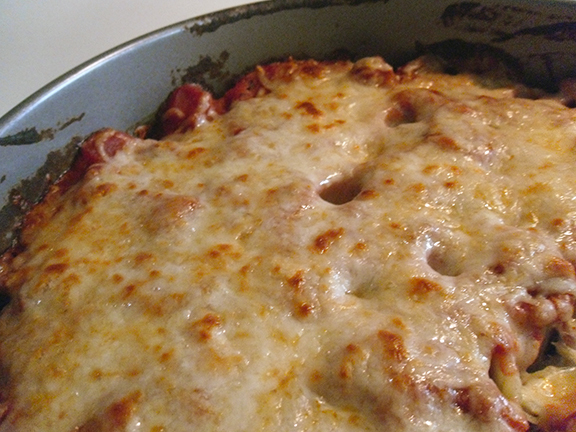 Here’s a perfectly simple, yet elegant way to serve your favorite red sauce and an excuse to cover it in cheese. This isn’t so much a recipe as an assembly method. I saw a photo like this on pinterest before I was pinning myself so I’m not sure who came up with it, but it sure looks pretty! This is a good (cheap!) company dish. Search the megamart for some rigatoni, about a thumbs circumference and two inches long. 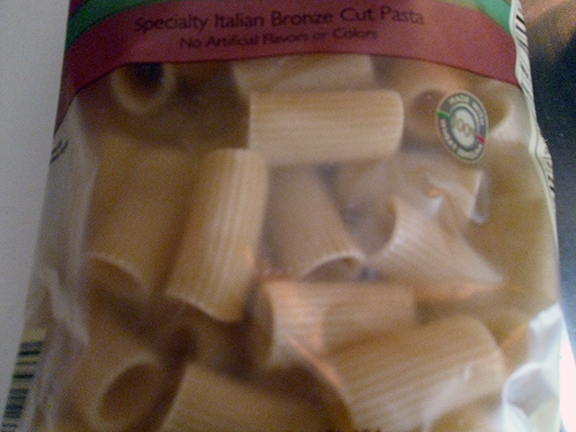 Different brands are difference sizes it seems, either that or lots of pasta is called rigatoni. Finding it is actually the hardest part of this dish, I swear! Step 1. Prepare your sauce! Boil your pasta, get it just to al dente since we’re baking it too. Step 3. 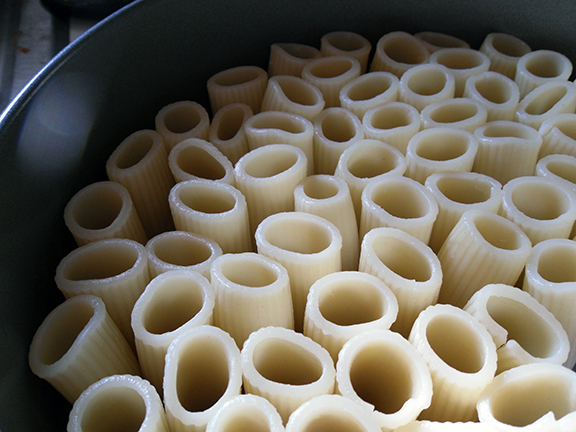 Drain pasta and turn it on its ends in the springform pan. This is where the tongs come in handy. You can just use your fingers (did anyone else do that witch finger thing with bugles? It’s a lot like that) if you let the noodles cool a moment. Step 4. Pour pasta sauce on top of upturned noodles. Shake pan a bit to get sauce to settle. Step 5.Top with shredded cheese and pop in a 350 degree oven for 20 minutes. Step 6. Pop the pan collar off and serve. Your guests will be sooo impressed. Next time I make this I am going to half fill the noodles with a ricotta-chicken-spinach filling with a piping bag to make tiny little stuffed cannelloni. This came out so well. My guests did, in fact, love it. There wasn’t any left – two people got seconds. Serve with tongs and a spatula. That way you hold the sauce in from the bottom and stabilize the noodles during the pan to plate transfer. Shoot pics of your creation over to Adriennethecook at gmail. I’d love to see! I just love this post! End Times: Rigatoni, Made Awesomer adriennecooksdotcom ftw!